Paul House was born in Germany and grew up in Singapore. He was educated in England, studying at Goldsmiths and Queen Mary College, University of London; and now lives in Spain, where he is a freelance translator. 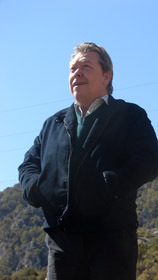 Paul House spends most of his time either in his flat in the centre of Madrid or in his house in Ocentejo, a small village in the mountains of Guadalajara.